The first time Pamela Z was at the McColl Center for Art + Innovation, the whole world came tumbling down. She remembers beginning her stint as artist-in-residence at the contemporary art space in September 2001 when two planes crashed into the World Trade Center in New York City. Old Glory was ubiquitous, spouting on lawns like a plants in a patriotic garden and fluttering from the aerials of passing cars. It was like seeing motorcades all day long, Z continues. Though it’s not on the scale of 9/11, Z, an artist who normally eschews politics, is returning to McColl at another tumultuous time in American history. As the McColl alumnus artist prepares to perform multimedia music pieces for voice, electronics and motion-triggered video on March 28, America waits to hear the full results of an investigation into possible collusion between the president and his party and a hostile foreign power. Maybe we all can take a cue from Z’s open-ended and eclectic approach to arts and life when it comes to coping with this new normal. Z, now 63, is a classically trained bel canto opera singer who majored in voice studies at the University of Colorado at Boulder. After gigging in local clubs as an acoustic guitar playing singer-songwriter, she discovered punk rock and experimental electronic composers like John Cage and Laurie Anderson. 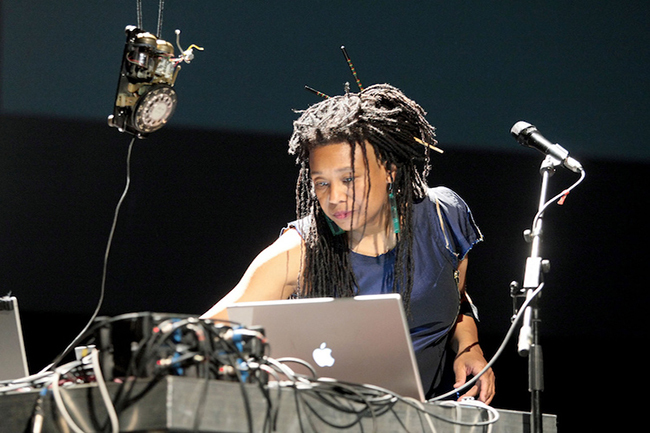 As she started experimenting with electronics, digital delay and sampling, she moved to San Francisco and reinvented herself as an inquisitive, constantly evolving artist who is no longer bounded by the career description of musician. Queen City Nerve: In Boulder, Colorado, you carved out a niche as a singer-songwriter. Why did you step away from that? At the same time I was doing a music program called the Tuesday Afternoon Sound Alternative at KGNU in Boulder. It was a free-form new music show. I was segueing from Stockhausen and Varèse to the Ramones, Talking Heads and the Roches. I woke up one day and realized that that the music I’m enthusiastic about, and playing on my radio program, is completely different from the music that I’m performing. I wanted to do something more experimental and adventurous. As a singer-songwriter playing guitar and singing, I was having a hard time finding a way to switch the path and compose work that didn’t sound like the stuff I had been doing. The thing that really jumped it for me was that I bought a digital delay. I went to a Weather Report concert where the whole band left the stage except for [bassist] Jaco Pastorious. He performed a duet with himself using a digital delay and his bass. Nobody was doing that at the time. The next day I went to a music store and said, “There was this guy. He had this thing. What was that?” The music store guy said it was a digital delay and I said, “I’ll take one.” So I bought it and the rest is history. As soon as I started playing with layering and looping my voice, my whole way of listening to sound and thinking about composition completely changed. I became interested in repetition, layers, texture and timber. Those things became as important to my music as melody, harmony and rhythm. The output of what I was composing for myself to perform completely changed, so much so that I had to move away from Colorado, because I had a fan base that wanted to hear me play Joni Mitchell songs. That was not what I was interested in doing anymore, so I moved to San Francisco and reinvented myself and started my life all over again. It was a complete break in terms of what I was doing. I feel that was the moment where I found my voice and art. You’ve also become more than a musician, drawing on other traditions and genres. Can you provide a capsule explanation of your live performances? It’s not like I shift what I’m doing from one thing to another, its more an additive process. Over the years, playing music became enriched by adding things that could be seen as performance art or visual art. I use a lot of projected images in my live performances. I’ve also started doing more installation work. They may be objects with sound and vision embedded in them, or installations that involve multiple levels of sound that inhabit a space. I’ve worked with movement artists doing collaborations that involve theatrical movement on stage. It’s a broad range of things. A typical solo performance almost always involves doing live processing on my voice, and also using gesture control instruments which allow me to manipulate the sounds with simple movements through different types of sensors. There are some wearable things and some physical things that are on me that send signals to my computer to change the processing on my voice in real time, or trigger sampled sounds, or open and close loops. With this gesture movement there are often projected images. I use video which is sometimes interactive, meaning that I do things in live performance that affects what’s happening on the projections. You’re participating in a panel with current McColl Center artist-in-residence and Guggenheim Fellow Michael Harrison and UNC Charlotte Assistant Professor of Clarinet Jessica Lindsey. But there will also be a collaboration with the UNC Charlotte Clarinet Choir. What will that entail? I’m still working out what I want to do with the Clarinet Choir. I have a feeling that it will be a structured improvisation. I’ll probably put together an instructional score, or a graphic score, or it might be a conducted thing. There’s a type of work that some contemporary music people do that involves using conduction to signal a message to an ensemble as to what to play, and when to play. There may also be a list of rules or guidance on what kinds of sound vocabulary to choose from. Moving ahead, do you see incorporating artificial intelligence, or virtual reality into your performances? People are always asking me if I plan on doing VR in my work, or using some kind of 3-D technology. I don’t have a strong desire to do that, but if a piece comes to my mind that could be augmented by that sort of thing, then I would add it. I don’t have a plan for some kind of a VR opera, but you never know. It’s taken me a while to warm up to some of those things because I’m not thrilled about making a work that people have to experience wearing a helmet. I did see one VR piece Laurie Anderson made that was beautiful. It was a gorgeous piece and I thought it was the most artful use of that medium that I’ve ever seen anywhere. That made me think maybe someday I’d want to do something like that. But you still have to put the damned thing on your head. Someone is being cloistered off in a world all by themselves, experiencing something but the people around them see a person with a headset covering their eyes and ears. They’re shut off from the actual environment they’re in, imagining one that is being projected onto their senses. There’s a limited appeal in that for me. I think there’s so much more richness to be found in actually reality. I feel that virtual reality hasn’t yet caught up to that by a long shot. You once did a piece for a compilation CD of experimental music in the 1990s, made up mostly white guys. A reviewer wrote coverage of the men which was quite detailed, but when he came to you the description was kind of sparse. [A member of] the press wrote a review of this compilation CD. In his review he spoke extensively about every work that each of these guys did, not ever comparing them to someone else, but actually describing what the work sounded like. Then when he got to me, he just said, “And Pamela Z introduces a work in the Laurie Anderson mold.” That sentence was his entire review to my contribution to the record. It said nothing about what my work on that record sounded like. I was very annoyed, because I felt it was an unconsciously sexist reaction. [It’s as if] you hear some work, and if it’s by a woman, you already have all these assumptions about what it would be. The other works were actually listened to and discussed at length, rather than just writing something off by comparing it to somebody else. I feel things have definitely improved since then in terms of the notoriety and presence of women doing this kind of work. I think that the attention that it gets and the way that it is viewed has evolved. It’s [similar to] racism. It’s not like it’s solved, but it’s definitely improved, and hopefully we’re continuing along that path.